Every summer there are numerous articles written about the adverse effects of altitude and temperature (density altitudes) on aircraft performance but there is little discussion of the effect of heat on pilot performance. As is often the case the military has done research and development that can be useful in general aviation. In 1978 Dr. Richard Stribley, Captain, USAF, from the USAF School of Aeronautical Medicine, published a very important paper titled Fighter Index of Thermal Stress (FITS): Development of Interim Guidance for Hot Weather Operations. The main point of the study was that as temperature and humidity increase, pilot performance decreases. This will come as no surprise to people who have been exposed to extreme heat conditions in the summer but the study used scientific methods to define hazardous conditions for high temperatures. 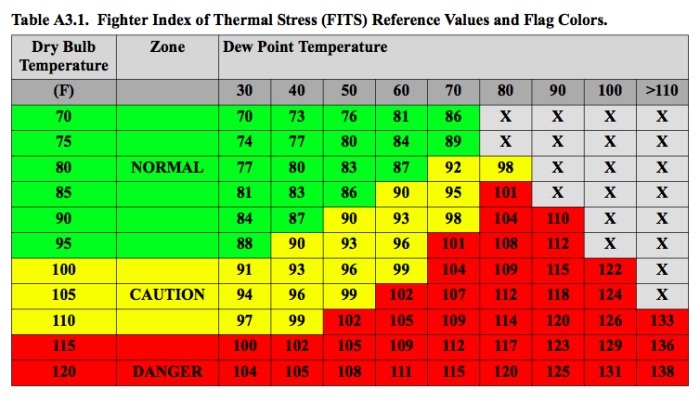 The following chart identifies those conditions that are hazardous based on ambient temperature and dew point temperature, two values readily available in METARs. What can you do about this? Well the first rule is one we have all heard: HYDRATE. Drink plenty of fluids to replace what you have lost through perspiration in hot, humid environments. You need to aggressively work to replace the fluids your body loses in these conditions. Pilots of aircraft with no relief facilities have been known to intentionally dehydrate so they don’t have to answer nature’s call during a flight. This is a bad idea in high temperature environments. While you don’t need to relieve yourself as often when you are dehydrated you are subject to weakness (low G tolerance) dizziness and confusion when you are dehydrated. A very clear symptom of dehydration is darker yellow urine when you go to the bathroom. So drink plenty of fluids and make a pit stop just before getting in the airplane even if you don’t feel like you need to right then. The good news is that your body acclimates to high temperature and humidity over a period of 10 to14 days. Your body is even more tolerant to extreme temperatures if you exercise in those conditions for two hours each day. The bad news is that you lose that tolerance only one week after returning to cooler environments. What does this mean in practical terms? When I was stationed at Luke AFB outside Phoenix, Arizona in the summer we are were only allowed to abort one aircraft for a maintenance problem and go to another. If we aborted the second aircraft we were required to go to an air conditioned facility and cool down for at least half an hour. We also carried two flasks of water to hydrate before and during the flight while on the flight line. What it means for those of us flying general aviation aircraft is that you might want to give yourself a cool down period after loading and pre-flighting the aircraft before you start, taxi and takeoff. My son and I made a flight from San Diego to Reserve (T16) in the mountains of northwest New Mexico with a fuel stop in Phoenix in July in a Cessna 172 (no air conditioning). We left San Diego early in the morning when it was cool and climbed to altitude with a cool outside air temperature until we started our let down to Falcon Field in Mesa and it was like descending into a furnace. We cooled down in the FBO’s air conditioning and drank their complementary iced tea while the line crew refueled the airplane. When we were ready to go we minimized our time on the ramp and climbed back up to cooler altitudes to clear the mountains between Phoenix and northwest New Mexico. It took a while to get to altitude due to the decreased aircraft performance in the 110 degree heat. We also took bottles of water with us to rehydrate after we got up to our cruising altitude. Bottom line: don’t let yourself become dehydrated and hyperthermic if you operate in high temperatures and high humidity. 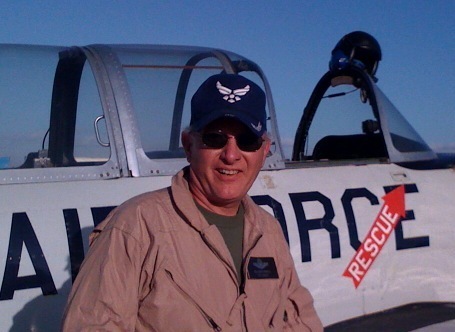 Instrument flight instructor (CFII), rated airline transport pilot (ATP), former military instructor pilot in F-4s and F-15s. Aircraft accident investigator and flight safety consultant. FAA Safety Team Lead Representative. This entry was posted in Cockpit Resource Management and tagged dehydration, Falcon Field, fighter index of thermal stress, hydration, hyperthermia, Thermal stress. Bookmark the permalink.